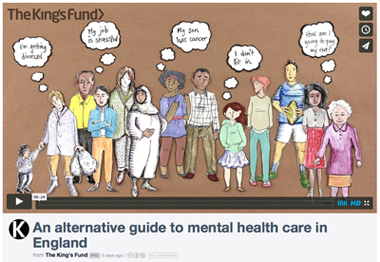 Welcome to Changes Health & Wellbeing, 12 Steps to mental health charity. This website is for those who wish to learn more about Changes user-led organisation and unique recovery service for those in mental distress. 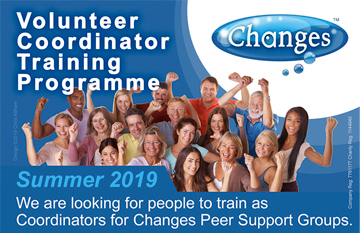 The aim of Changes service is to provide an opportunity for those suffering from mental distress to move from isolation, withdrawal and dependency to becoming active and contributing members of their immediate and wider community. Who uses Changes service? People experiencing various levels of mental distress, including: worry, feeling low, confusion, anxiety, panic, depression, mood swings, strange ideas or senses playing tricks. How does Changes fit in with existing services? Very nicely! Our programme is designed to complement any help you are receiving from other statutory or voluntary services. Can Changes help me? Yes! 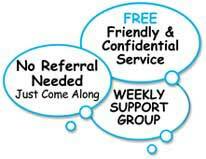 Our service can help with any form of mental distress. Provided you can attend and get involved you'll make progress. A massive thank you to the people of East Staffordshire for making us so welcome and helping Changes to spread its message of love, hope and recovery – strengthening communities, changing and improving the lives of literally thousands of people in mental distress. 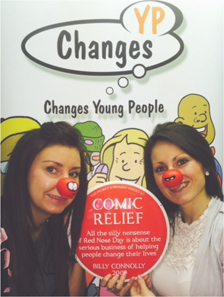 Changes Young People's service receives Red Plaque recognition for vital work. Read full press release here. Motivational cupcakes raise awareness of Changes YP services to students & staff at Stoke Sixth Form College plus £150! 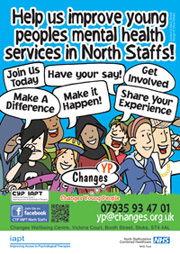 NHS Trust joins forces with Changes YP to help improve mental health services for young people in North Staffordshire. Tuesday 24th June 2014 article in The Sentinel newspaper... Alec Wrench memorial football fundraising tournament. Changes Health & Wellbeing are very grateful to Alan & all those involved. We wish you all the very best with your continued fund raising in memory of Alec. Thank you. 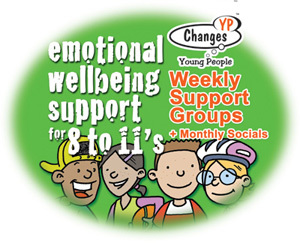 Changes Young People is a branch of Changes service specifically for 11 to 25 year olds. Changes provides a unique recovery service for those in mental distress, based on weekly mutual-help groups and users following Changes 12 steps recovery programme. Changes Wellbeing 6 Courses x 2.5 hours each. Informal friendly courses for those wishing to improve their mental fitness. Changes Recovery 7 Workshops x 2.5 hours each. Informal recovery worshops using Changes 12 Steps to Recovery from Mental Distress. Available half day & full day hire. Well equiped video, OHP, digital presentation facilities. Changes Health & Wellbeing is part of the HMPPS and ESF Funded CFO3 Project which is designed to help offenders move towards social inclusion and mainstream provision. For the latest Jobs and Volunteer opportunities plus Volunteer Training with OCNWM accreditation. CYP IAPT Improving young peoples mental health services in North Staffordshire. Changes confirms it's commitment to Equal Opportunities in all areas of it's work, ensuring all individuals - paid staff, volunteers & service users - are treated in a fair & equal manner.